New Jersey residents must title and register their vehicles at a Motor Vehicle Commission (MVC) agency before driving it on public roads. A motorist must be at least 17 years old to register a vehicle. Two license plates will be issued upon registering a vehicle. State law requires all motor vehicles in New Jersey to display license plates issued by the MVC. When you title and register a vehicle, you will receive two license plates. 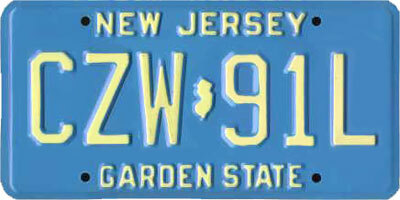 New Jersey is one of the states that require vehicles to display front and rear license plates. Motorcycles and trailers receive one license plate, for rear only. If your plates are lost, stolen, or damaged, you can apply for replacement plates at a motor vehicle agency. If your plates were stolen, you must file for a police report to the municipality where the plates were stolen. If you plates are damaged, you must surrender your old plates upon receiving the new plates. The plates must also be returned to MVC if the vehicle insurance is terminated. When you acquire a new vehicle, you can transfer your plates to the new vehicle as long as the same name is used for both registrations, and the registration code remains the same. If you sell a vehicle and do not wish to transfer its plates to another vehicle, you must surrender the old plates. Buying a used car in New Jersey? Don’t make a costly mistake. Run a Free License Plate Lookup for your New Jersey-registered vehicle! Run a Free New Jersey License Plate Lookup to uncover the full-story of your New Jersey-registered vehicle.